On any slide with incrementals, an indicator of incremental progress will appear in square brackets next to the overall slide show progress on the title line. It’s a little crude, I admit, but it serves the purpose well enough. Clicking on the title of either the Elapsed Time or Remaining Time counters will “minimize” them. Click a minimized title to maximize the box. The actual minimum and maximum effects are purely CSS-driven, hooked onto a collapsed class name. I’m still pondering the best way to handle this feature, so the class name may change, as for that matter may the mechanism by which one can min/max the boxes. Suggestions are welcome. Keypresses and clicks are passed from the note window back to the slide show. In other words, the slide show fully is fully operable from either the slide show window or the notes window. The only difference is that the notes window doesn’t have the navigation links and popup navigation menu (said difference to disappear in a future release). That’s it. In the process, though, I uncovered a bug that shows up in Safari 1.3.1 and 2.0, where it’s ignoring the show-first feature for incrementals. I’m going to assume that the problem lies in the getIncrementals() function, though of course I could be wrong. If anyone can spot the error and provide a fix, I’d be grateful. Update 2 Mar 06: in addition to the Safari problem, I’ve discovered that IE/Win doesn’t seem to share event information between windows. Thus, if you try to run the slide show from the notes window, errors get thrown. I managed to fix this in clicker() by adding a test for notes-window events, but trap() has a very different structure and I’m not sure how to fix it. Thus the testbed in IE/Win currently lets you advance the slide show from the notes window by clicking the mouse button, but keyboard navigation throws an error. If anyone can tell me how to get around this, even with a pointer to a good article on passing events from one window to another, I’d be very grateful. It’s back: S5 1.2 alpha 1 is now available (177 KB Zip archive), and you can play with either the OSF or XOXO versions of the latest development version if you just want to preview it online. In addition, I’ve set up a contact address specifically for S5 questions and feedback. You can find a link to this new address on the main S5 page. The progress indicator (e.g., 6/10) is now a permalink to the currently-displayed slide. This will require an update to any S5 1.1-era themes, but it’s a minimal thing. Granted, the current alpha doesn’t have updated styles to handle the presence of a link. I’ll get to it. Bug fixes intended to make it more Konqueror-friendly. I do not know if Konqueror will run S5 1.2. I do not have access to Konqueror. The fixes I included were sent to me by helpful S5 users, and may or may not have resolved all problems. If there are still bugs in S5 when displayed in Konqueror, you are invited to submit bug fixes in the comments, or via the contact address I mentioned before. Bug reports should be done in the comments, where other Konqueror users can see them, and not via the contact address. A “notes” window capability. The notes view is largely the work of Shaun Inman, who wrote me last week to say, “Hey, I did this. Interested?” Was I ever! 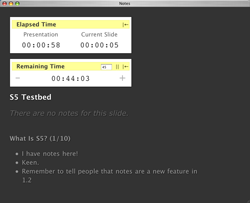 I’d been meaning to do it ever since I saw the notes view in Keynote, but Shaun got there first, clever wolf that he is. The general idea is that you load up your presentation, open the notes window, and put the presentation up on the projector while keep the notes window on your presentation machine. (Which is of course only possible if you turn off video mirroring.) As you move through the slide show, you can see notes to yourself and keep track of time so you don’t run over. Keen. I don’t know how much I personally will use the notes, but I’m all over the timers like they were a stack of pancakes and I were Mrs. Butterworth. On a related note, I’m not sure that notes can be made to use with Opera so long as S5 relies on OperaShow, because OperaShow by its very nature makes all browser windows fullscreen. If there’s a way to get OperaShow to put one window on one monitor, and a second on a second monitor, then that would be the answer. If not, I’m not sure what to do short of abandoning OperaShow usage entirely, which seems strange and wrong. But we’ll see. If nothing else, we can verify that everything in S5 besides the notes feature works in Opera, and push those changes into an S5 1.1.1 release. One known problem is that when Firefox displays an S5 show using the text/xml or text/xhtml+xml MIME types, which is necessary for slide shows that incorporate things like MathML and SVG, things break because innerHTML ceases to be supported. I have a proposed fix submitted by an S5 user, but did not get it into 1.2a1. I plan to correct this before reaching the first beta release. A number of people have asked for a merging of effects libraries like Script.aculo.us and FACE, and there have even been scattered implementations of same. It’s definitely tempting. I’m not at all confident that this will happen for 1.2, though, mostly because I don’t understand enough programming to make the connections. I’m also not sure how many of these I could pile into the code before the whole thing came crashing down. I have hopes that we’ll be able to work out a “best practices” way to add such capabilities to any S5 presentation file, and let each author add them or not as they see fit. Oh, sure, I build a slide show system specifically because of a bug in Opera 7.5, and despite that I go fairly far out of my way to make sure that Opera will still be able to display the slide show using its unique and groundbreaking feature, OperaShow, and now I’m the bad guy. And the crowd, against all expectations, went wild. So the list of things I thought would be interesting to add some day suddenly took on extra weight. There were people out there who actually wanted to use S5, and wanted things like font scaling and incremental display of slide content. Furthermore, there were people contributing code to improve the system. Out of nowhere, a little open source project erupted in the comments of my posts. In order to keep things from bogging down, I defined a feature list for S5 1.0 and shipped it out. All along, I made sure that the slide show would fall back to OperaShow in Opera. To do so, I had to write a routine (called notOperaFix() because it had to fix things for browsers that aren’t Opera) that swapped around the media values for various linked style sheets, among other things. I also had to define the S5 format so it was compatible with the OperaShow Format specification. That meant changing some things from my original file format, and in my opinion not always for the better. Despite a few people telling me to just drop OperaShow and OSF support because it wasn’t worth the effort, I kept those mechanisms in place as we moved to version 1.1. I figured that since Opera had a slide show system, I’d let people use it. Besides, any time I created a test copy of S5 that didn’t let Opera drop back to OperaShow, it completely failed to display the slide show. Now S5 1.1 is out, and it has more features that people asked for—font scaling based on window size changes, incremental display, more keyboard commands, and so on. Throughout it all, I made sure OperaShow would still work. And it does. It doesn’t get the keyboard commands, or the font scaling, or the incremental display. I did try. I couldn’t figure it out. Now, there are those who apparently think that this means I’m a liar when I say S5 is cross-browser. I admit it—S5 doesn’t work in Mosaic 1.0. It also quite likely fails in IE5.0/Win. Actually, I think it fails in IE5/Mac, which is ironic since my starting point for S5 was a rudimentary slide show system written by Tantek Çelik. But it does not fail in Opera, because it’s quite intentionally designed to be OperaShow compatible. It isn’t feature-identical, but then, the features in (and version number of) Opera for the Mac usually lag behind Opera for Windows. After all, it’s not like I sprang this on the world. The last eight beta and release candidate versions of S5 were published here. Comments and contributions were solicited and welcomed, and many were received. The state of Opera support has not changed one iota in all that time. There were several months in which anyone could have stepped up to the plate and contributed fixes for Opera. Did anyone? No. I’d do it myself, except I’m not sure I can. For example, I just a few hours ago made a copy of the S5 package, unpacked it, and edited the JS file so it did no Opera detection: the scripts all ran on Opera the same as they do for any other browser. I loaded it into both Opera 7.5 and 8.02 for OS X, which is what I have right now. You know what happened? Nothing. The slide show didn’t happen. The outline view came up, changed slightly, and then sat there. And do you know why? Because Opera defaults to identifying itself as Internet Explorer. I’ll help out where I can, if anyone has questions about this bit of JS or that bit of CSS in the S5 directory. Post them here and I’ll do my best to answer. If I get hit with a bolt of genius and can suddenly fix the problems myself, I’ll do so, but odds are that won’t happen. It will therefore be up to the community to help out. This isn’t just me, as the credits page makes clear; S5 has long been a community effort. Put another, more succinct way: don’t complain, contribute. It’s more satisfying in the long run, and it’s more constructive. Just a quick note for any of you who might be both a BBEdit user and an S5 author: BBEdit 8.2.1, the latest update, will crash if you try to open any valid S5 presentation (I don’t know what happens with invalid files). Apparently there’s a bug in BBEdit’s XHTML scanner that the S5 file structure triggers. Version 8.2, which you can get from the Barebones FTP site if you don’t still have it locally, does not have the same bug, and will edit S5 files without any trouble. The folks at Barebones are aware of the problem and have indicated that a fix will be in the next maintenance release of BBEdit. For now, if you want to edit S5 files in BBEdit, stick to 8.2.